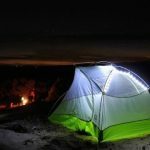 Marmot gave one of its best selling backpacking tents a makeover and made the Limelight 2 one of the most livable tents we’ve tried. Testers loved the interior room, easy set up and plenty of user-friendly touches. It’s a great one-quiver tent and ideal for anyone more interested in comfort than shaving down weight. 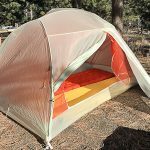 The Limelight feels much roomier than its 33 square feet of area suggests—that’s already above average for a two-person tent. Marmot bent the poles, effectively giving them knees. This bend pulls the tent body out at the four corners. A cross pole at the doors further steepens the two side walls and this tent has lots of elbow room. Four guys comfortably sat inside to play cards and pass around the Scotch. The two doors and two vestibules add to the spacious feel. The doors are some of the biggest we’ve ever seen in a backpacking tent. And the vestibules (one 9.5 sq. ft and the other 6.7 sq. ft.) offer plenty of storage. Just over five pounds, this is more middle weight for its class. Consider the space to weight ratio though and it seems pretty reasonable. It packs down equally in the middle of the road. With color coded poles and pegs, the three pole design is simple and fast to erect. The “knees” do nothing to diminish the weather shedding chops of this tent. It shrugged off a solid deluge. 68 Denier fabric on the fly and bottom are heavy weight for this category, providing peace of mind in any conditions. Further, fabric panels on the lower part of the tent body add three season utility—stiff winds won’t breeze through like they would if the walls were all mesh. The cross pole creates a porch that keeps drips from the open vestibule from landing inside. This is where this tent shines. The giant doors cover most of the sidewalls and unzip in almost a circle. Getting in and out never felt like a caving squeeze. In good weather the vestibule peels back for even easier ingress and egress. Loops in the ceiling are ready for a loft or drying line. Two big side pockets kept headlamps and books easy to find. And the bright color was easy to pick out in a busy campground.